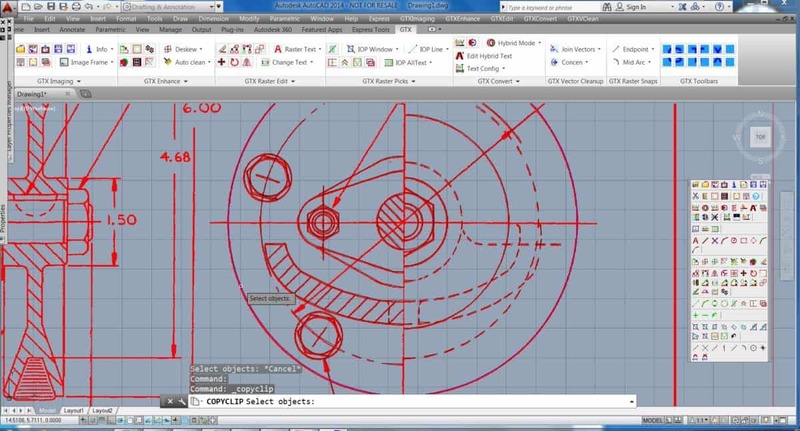 When you need information about GTXRaster CAD Plus, you’ve come to the right place. CAD / CAM Services is an authorized reseller, as well as a regular user of GTXRaster CAD Plus in our service bureau. This means that we not only offer competitive pricing, but we also offer experience using the software. We know that no matter how easy software is to use, sometimes you have a question about it. We use everything that we sell, so we understand it and we endorse it. Just click on the button below and fill out the form to get FAST information and pricing on GTXRaster CAD Plus. GTXRaster CAD® PLUS contains all the raster editing and manipulation capabilities of GTXRaster CAD with the added functionality of automatic raster to vector conversion technology for the AutoCAD environment. Designers have used the software that has been providing real world solutions in the Technical Imaging industry for almost three decades! With the latest licensing technology, users will benefit with the FLEXENABLEDTM Software licensing program – using the Flexera® FLEXnet Publisher – for either standalone single-user installation, or for multiple users with network installation. In addition, network users have the option to accommodate previous versions with our NEW Package Licensing support for their network environment using Version 2014 along with previous versions 2013, 2012, and 2011. The GTXRaster CAD 2014 Series is only available with software licensing; hardware keys are no longer supported in this new version. GTX solutions are designed and developed for use in Mechanical CAD (MCAD), Automated Mapping and Facilities Management (AM/FM), Architectural, Engineering, and Construction (AEC), Geographical Information Systems (GIS), Power Generation, Oil and Gas, Military, Government, and Service Bureau markets. If you are working with scanned paper drawings, either black and white or color, and the AutoCAD 2014, then GTXRaster CAD Plus provides you with the most cost effective raster cleanup, raster editing, or raster-to-vector conversion solution. Save time and money! Using technology developed for the unique & innovative GTXScanClean automatic image clean-up software, GTXRaster CAD Plus products now incorporates both automatic image clean-up and verification / quality control functions. GTXScanClean is protected by U.S. Patent No. 7,016,536. GTXRaster CAD® 2014 Series for AutoCAD 2014 has been fully ported to the 64-bit platform and can run as a native 64-bit application directly on the Windows 8 x64 Edition, Windows 7 x64 Edition, and Windows XP x64 Edition. Only software licensing is supported on the 64-bit platform. Just Like AutoCAD – Because the GTXRaster CAD Series is integrated with AutoCAD’s Image Support Module (ISM), all commands, menus and toolbars are consistent with AutoCAD 2014. Designers find a productive and very easy-to-learn, ribbon user-interface. The GTXRaster CAD 2014 also includes PDF support, allowing the user to open and save a PDF file. GTX has developed numerous commands to make working with raster images easier and more manageable. New raster editing commands include gMCopy (multiple copies of selected raster move to new location), gTEXT (draws raster text in current image), gCTEXT (change raster text by text replacement), gHTEXT (edit vector text and create a raster underlay), gHYBRIDMODE (enable vector overlay of drawn raster lines, arcs, circles, rectangles and text), gDETACH (unloads or detaches a raster image, and gROTRECTANGLE (draw a rotated raster rectangle)and many other methods. These NEW features allow the user work quickly through the tedious editing process, thus saving time and money! Quickly clean the scanned raster image with commands such as deskew, despeckle, and crop. Or, erase any part of the image, with raster erase and raster outline. Then draw AutoCAD vectors over the top of the image. GTX’s Intelligent Object Picking (IOP) technology allows you to work with raster entities as intelligent objects. Use this feature to select raster entities (line, arc, circle) even if touching other data. Use the All Text IOP to select all raster text entities. IOP preserves underlying geometry during erase and raster to vector conversion. You can now load a black and white or color scanned PDF into GTXRaster CAD Series 2014. This gives you the ability to convert your PDF scans into Tiff and you can also convert from Tiff to PDF. GTX has improved the user interface for AutoCAD 2014, you have the standard “Classic” drop down menus and toolbars and now you have a fully integrated Ribbon as well as additional toolbars that are fully integrated into your AutoCAD environment. Quickly convert any or all selected raster into rectified and accurate AutoCAD entities. Convert selected raster objects into intelligent AutoCAD entities such as lines, arcs, circles, polylines, and true AutoCAD text. Its ability to recognize line styles, splines, cross-hatching, arrowheads, and also the ability to set a gap jump variable, further increase conversion accuracy. Easy to use Color Reduction functionality to enable full color scan files to be reduced from up to 16 million colors down to between 256 & 4 colors, or even bi-tonal (black and white) images. A powerful Color Separation facility to enable selected colors to be grouped together and separated into new layers and assigned an appropriate color of the user’s choosing. Using the latest available color processing algorithms, ALL the products in the GTXRaster CAD® Series, Version 2014 include the gReduce, gSeparate & gBi-tonal commands. Fully Compatible and Optimized to run in the AutoCAD 2014 environment. Edit Raster GeometryAlso available in French, and German language versions! CAD / CAM Services is one of the largest providers of CAD / CAM conversion software and services in the USA. We are experienced users of GTXRaster CAD Plus, as well as all of the other software products that we sell. We invite you to contact us for expert information and competitive pricing on GTXRaster CAD Plus and, don’t forget… we’ll also do your conversions for you!